The Python 3 is a third-party accessory developed by QuickShot for the Sega Mega Drive. 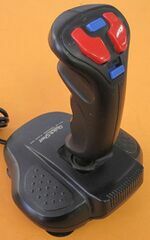 It is a joystick, and a "sequel" to the Python 1 (and Python 1M) and Python 2. The Python 1 is compatible with various 80s home computers, while the Python 2 is for the NES. The Python 3 has three buttons as well as a turbo switch. It is designed to be stuck to a flat surface for stability, and ergonomically designed like other QuickShot joysticks. The history of the Python 3 is odd. Whereas the Python 1M was adopted by Tec Toy as an official product in Brazil, it seems the Python 3 mould was recycled by other companies. The GeniStick is almost identical to the Python 3 bar colour and naming schemes and the Mega Control Stick by TecnoPlus is also similar. It was also released in Germany by Okano as the Python GL-MD3. Main article: Python 3/Magazine articles.